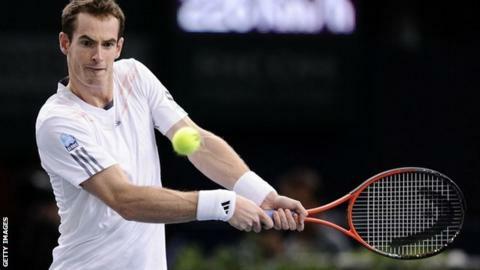 Britain's Andy Murray was made to pay for failing to convert a match point as he lost to Poland's Jerzy Janowicz in three sets at the Paris Masters. The third seed stood on the brink of victory when serving at 7-5 5-4, but some careless play let Janowicz off the hook and he took full advantage. Janowicz dominated the latter stages, winning 5-7 7-6 (7-4) 6-2 to reach the quarter-finals at Paris-Bercy. Murray will now head to London for next week's ATP World Tour Finals. "All three of Murray's defeats since his US Open triumph have been from match point up. They've all been very different situations - Raonic in Tokyo, Djokovic in Shanghai and Janowicz here in Paris - but he admits he must be sharper next week at the O2, his final event of the season. It's was a really odd match. Murray was sloppy with his groundstrokes, serving for it at 5-4 in the second, and got so visibly frustrated with himself he got booed by a section of the lively Paris crowd. The match turned as Janowicz, who previously had impressed mainly with his monster serve and well-disguised drop shot, started to play some inspired tennis from the back of the court. By the end he was clearly the stronger player and he collapsed to the court at the end. "The best day of my life" he said, which Murray should take as a compliment. He follows top seed in Paris, while world number one Roger Federer chose not to compete as the leading players dealt with Paris and London being played back-to-back for the first time. Murray said he was unsure how the early exit would affect himself and Djokovic at London. "Only time will tell really," said the Scot. "A lot of the players will have had slightly different run-ins to the O2. "Obviously me and Novak lost early this week; Roger didn't play, and then I think the rest of the guys are still in here. You never know, maybe the guys that go deep here they'll have confidence from having a good tournament. But they may arrive a little bit later and might take a while to get used to the conditions." Murray had never been further than the quarter-finals in Paris and showed every sign of being motivated to improve on that, and boost his ranking points in the process, but for the third successive tournament he lost after holding match points. At 6ft 8ins tall and close to a career-high ranking at 69, Janowicz provided a stern test from the start and Murray did well to edge the opening set with a single break in game 11. A blistering forehand return off a thunderous Janowicz serve seemed to have given Murray the decisive breakthrough at 4-3 in the second set. A regulation win appeared imminent when Murray moved to 30-0 and then match point at 5-4, only for some careless forehands to allow Janowicz back into the match with his first break of the day. The pair had met once before in the Davis Cup three years ago, a match that Murray won with plenty to spare, but the 21-year-old Janowicz is enjoying a breakthrough year and began to dictate against the US Open champion. He controlled the tie-break from the outset and broke twice in the decider as Murray's challenge faded dramatically. The Scot managed to land a couple of blows in the closing moments but Janowicz held his nerve to serve out for the win of his career, falling to the floor before rushing to celebrate with his coach. Janowicz said he was experiencing a "thousand different feelings" after the victory and admitted it had been an "unbelievable" week in Paris for him. "I could never have expected something like this," he said. "I'm not sure what I'm supposed to say after this match, this is amazing." In the doubles, Britain's Wimbledon champion Jonny Marray and Aussie partner Paul Hanley beat American top seeds Bob and Mike Bryan 6-4 6-7 10-5. Marray is also preparing for next week's ATP Finals, where he will reunite with Denmark's Freddie Nielsen - his partner at Wimbledon, where they beat the Bryans en route to the title.